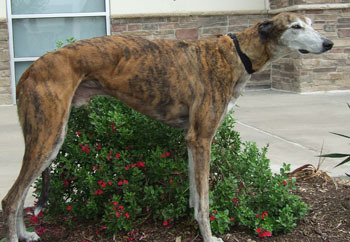 Marvin is a 9-year-old brindle male born January 8, 2003. His sire is Mocan Speed and his dam is Grand Idea. Marvin has no races to his credit, and is more than ready to find a nice family and soft bed of his own! Marvin is so calm, cool and collected. He seeks out the comfortable spots and never tries to get on the furniture. He hangs out wherever the humans are and if one leaves the room, Marvin follows to see what's going on. Marvin collects toys and hides them in his bed. After two weeks in the house he is starting to show his bouncy side! He plays with toys briefly and likes to join in the play time in the back yard. He loves to go on short walks, get deep neck messages and EAT! He has a cute snaggle-tooth grin when his lip gets caught on his lower canine. All Marvin requires is space to lie down, preferably on a dog bed, though any blanket or comforter will do, lots of neck scritches and hugs! 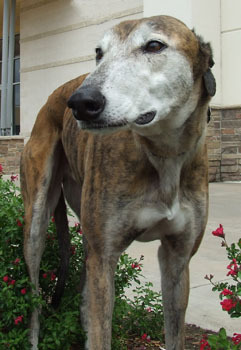 This lovable, good-natured Velcro Boy is ready to hang out and enjoy all the comforts of home.